Beautifully preserved hammer and sickle embellishments from the time when the building housed a Soviet legation and embassy, restored 1950s Oswald chairs, Serga lighting fixtures, original Milton Greene photographs of Marilyn Monroe and a glassed-in patio are just some of the elements which distinguish the Signature. Go on a virtual tour of the Signature Restaurant! 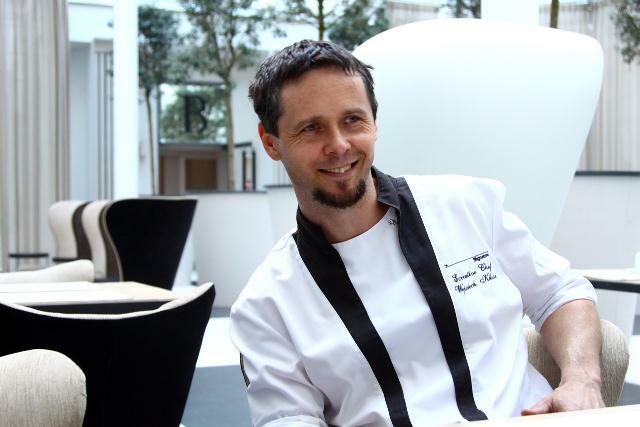 Chef Wojciech Kilian’s culinary creations emphasise seasonal food, with Polish accents and sophisticated flavours. An original menu where 90 per cent of the ingredients are organic. Wojciech Kilian searches for distinctive flavour combinations of his own invention, inspired by the culinary arts of such masters as Thomas Keller and the Roca brothers. The quality and originality of the Signature’s cuisine is confirmed by the prestigious awards and distinctions the restaurant has received, including a couvert & Two Forks in the 2016, 2017 and 2018 Michelin Guide, given to the best restaurants in Europe, and a first and third prize in the highly-respected Food & Wine Noble Night in 2014. We cordially invite you to the Signature.